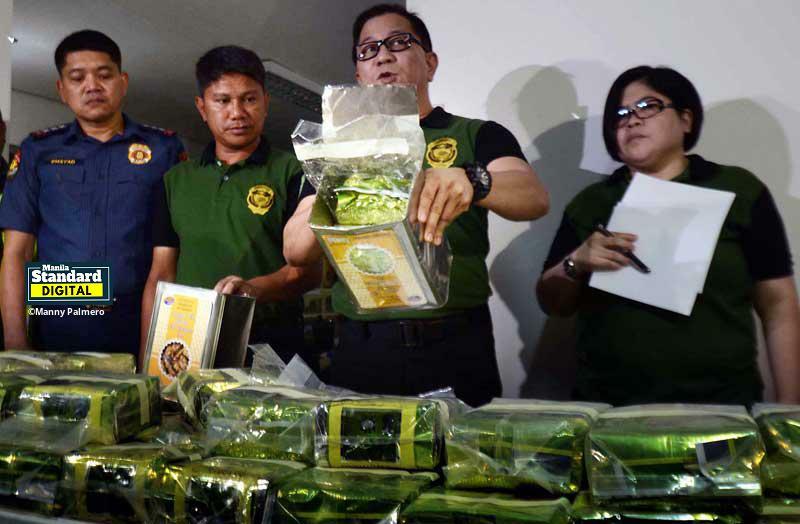 Not their cup of tea, as the Bureau of Customs and the Philippine Drug Enforcement Agency seized Friday some P1.8 billion worth of shabu at the Manila International Container Port, the biggest single haul of illegal drugs discovered by authorities this year. The PDEA immediately tagged an opprobrious Southeast Asian drug syndicate as behind the shipment and packed to appear like tea products. In an interview on Super Radyo dzBB, heard nationwide, PDEA chief Director General Aaron Aquino said the Golden Triangle international drug syndicate smuggled the confiscated contraband. BoC-MICP District Collector Erastus Sandino Austria said the shipment from came from China containing 276 packs of shabu weighing 276 kilos. The intercepted drugs, estimated to be worth P1.8 billion, were found inside a 40 ft. container consigned to Wealth Lotus Empire Corporation. The container which was declared to contain plastic resin and tea arrived on March 17, 2019 at the Manila North Harbor. “PDEA received information from our international counterparts from Vietnam that the container aboard a ship named Callao Bridge V145E from Ho Chi Minh City, Vietnam arrived in Manila. The said ship contained huge amounts of illegal drugs,” Aquino said. Austria said he ordered to place under X-ray examination the shipment, followed with the full physical examination of the container of the suspected shipment with the presence of representatives from the PDEA, and the Philippine Coast Guard. When the container was inspected, Customs and PDEA found 11 sacks containing items wrapped in clear cellophane and sealed in foil packaging designed to look like tea products. Upon testing the sample of the subject substance, authorities were able to confirm that the items were shabu. “The Bureau is always on the lookout for smuggling attempts, and we take all intelligence information on the existence of drugs seriously,” Austria said. Through strengthened linkages, proper coordination, and intelligence sharing, Customs was able to foil this shipment of illegal drugs and is confident that it will be able to better guard the Philippine borders against the entry of contraband because of its close partnership PDEA with other agencies. “The Bureau of Customs and PDEA remain vigilant to intercept such kind of shipments,” Aquino said. The contents of the shipment will be inventoried, and the illegal drugs found have been turned over to PDEA for the proper handling of the substance and investigation purposes. “The BoC will immediately revoke the customs accreditation of the involved consignee and customs broker, and appropriate charges will be filed against them,” said Commissioner Rey Leonardo Guerrero. “I have ordered all district collectors to alert and examine all other similar items to ensure that our border is safe from the possible entry of illegal drugs.” Guerrero added. Guerrero said he would immediately revoke the Customs accreditation of the involved consignee and customs broker, and appropriate charges would be filed against them.